Read SEEDS OF DESTRUCTION by F. William Engdahl. GMOs have been created to control food and to ultimately be used as a weapon. Control the food, you control the people. The reason that we need to stop the Gmos !! Is because ; what happens if one year they put so much on the crops, That it poisons the food that people die ?? Wouldn’t that give them an excuse to do a recall on all food ??? YES; this is defiantly a possibility !! What would that do ?? IT WOULD CAUSE A NATIONAL SHORTAGE OF FOOD , AND POSSIBLY A WORLD SHORTAGE !! Get them off our food !!! or the next thing ; Will be us trying to get them off our bodies ! These gmo people are evil !! And sly !! as the devil ! STOP THEM NOW !! God Bless America !! The In God We Trust America !! 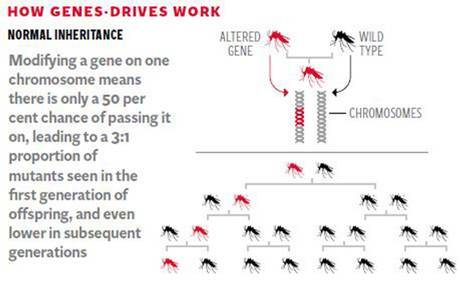 What people seem to fail to understand, or appreciate, is that spread via ‘gene drives’ still occurs through inheritance of genetic material. Yes, we should take precautions to prevent accidental release of transgenic organisms from labs. That goes without saying. But the idea that this “has the potential to be used by terrorists as a bio-weapon directed against people or livestock because the genes – which are capable of spreading like a virus” is a bit of a stretch. 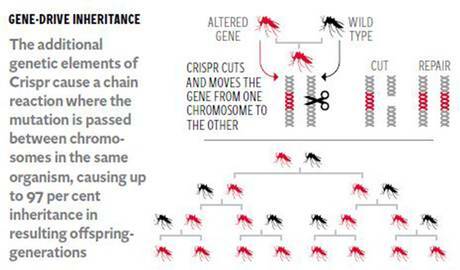 Mostly because very sick individuals, and especially dead ones, aren’t likely to reproduce and pass on their genes. One angry moderately well off genius with an improvised modern laboratory might/could be enough to set off a global chain genetic cataclysm that would at least parallel the horrors outlined in the now cult film No Blade of Grass — or much much worse. And there are a lot of such angry/mad geniuses roaming the planet. It is only a matter of time.